Y'all, I'll be straight up. This book has done something impossible: it's a middle grade book that I loved. Technically, it's probably right on the cusp between middle grade and young adult, but still. This book is everything I've ever wanted out of a book aimed at tweens/young teens and have never gotten before. The writing is simple and fast-paced enough to keep readers engaged, but there is enough depth and emotion to satisfy even older, picker readers like myself. The book is narrated by Stephen, who is the best friend and often second-fiddle/wing-man/backup to Marco. Marco and Stephen have a close-knit friendship based on their love of solving mysteries, and they're often inseparable, but this story has a lot of growing pains for the lifelong friends as they begin edging towards young adulthood. Neither character is perfect, and Marco is especially hard to like sometimes. He can be moody, irrational, and self-centered, and has some ridiculous ideas -- but then again, doesn't that sound like lots of 13 year olds out there? Stephen is easier to like, as he's a bit more even-tempered, to the point where he kind of lets Marco walk all over him sometimes. You can tell that he resents this, but he doesn't quite know what to do about it. It's a tough spot for an adult to be in, let alone a teenager, so it's understandable that he struggles with their friendship and how it's changing. Marco's grand plans for investigations have gotten the pair a bit of a reputation around school, but that doesn't stop Marco from trying to enact one last great heist before school is out and everyone goes their separate ways. He comes up with an elaborate plan to finally tell Benji how he feels, after pining after him for years. Of course, with all good caper stories, there are complications: it's a ridiculous plan to start with, and it relies on every step going just right. I don't think it's a spoiler to say that pretty much everything goes wrong. Add to that the fact that Marco's been dealing with some harassment at school for being gay, a fact that he tries to downplay for various reasons, and you've really got a recipe for disaster. I think this is a really smartly written book that shows that sometimes there are no easy answers, that life isn't always fair, and that things don't always turn out the way you want, but it does it in a way that doesn't make these life lessons seem like downers. 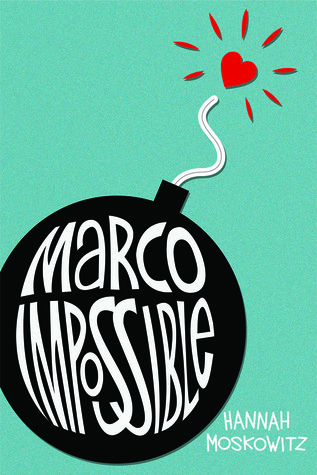 Life isn't always easy, especially for kids who are seen as different, and Marco Impossible doesn't try to hide this fact. On the flip side, the story also says that sometimes, going out on a limb with your feelings can result in good things, that there is always someone who cares about you, and that communication is essential to healthy relationships, be they romantic, friendship, or family. Many of the problems -- both in the main plot and in subplots regarding Stephen's and Marco's families -- could have been minimized if the people involved had just been more communicative with one another. I recommend this book to anyone looking for a fun, quick contemporary story with lots of funny, memorable characters. Even though the main characters are boys, this book should appeal to girls as well, and there are some strong, sassy women as secondary characters in this book, anyway. There is some swearing and slurs, and as mentioned, Marco is bullied and threatened by other students.